Hypoparathyroidism is a condition in which the body doesn't make enough parathyroid hormone (PTH), a hormone that regulates the amount of calcium and phosphorus in your body's bones and blood. Hypoparathyroidism is very rare. It is different from hyperparathyroidism, a much more common condition in which the body makes too much PTH. The most common cause of hypoparathyroidism is injury to the parathyroid glands, such as during head and neck surgery. In other cases, it is present at birth or may be associated with an autoimmune disease. Symptoms of hypoparathyroidism may include tingling in the lips, fingers, and toes; dry hair, brittle nails, and dry, coarse skin; muscle cramps and pain in the face, hands, legs, and feet; cataracts; dental problems; memory loss, headaches, and muscle spasms. Calcium carbonate and vitamin D supplements are the only currently approved treatment. Hypoparathyroidism is a condition in which the body doesn't make enough parathyroid hormone (PTH). This hormone regulates the amount of calcium and phosphorus in your body's bones and blood. Decreased levels of PTH lead to low levels of calcium and high levels of phosphorus in the blood. This imbalance can lead to problems with bones, muscles, skin, and nerve endings. The most common cause of hypoparathyroidism is injury to the parathyroid glands, such as during head and neck surgery. 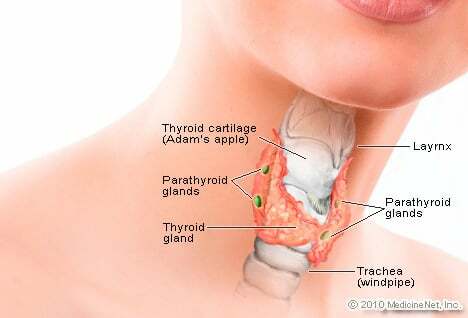 Parathyroid glands are small endocrine glands that are located in the neck behind the thyroid gland. 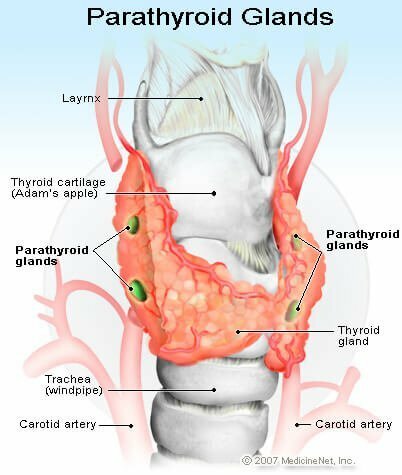 It other cases, hypoparathyroidism is present at birth or may be associated with an autoimmune disease that affects the parathyroids along with other glands in the body, such as the thyroid, ovaries, or adrenal glands. The goal of treatment for hypoparathyroidism is to restore the body's calcium and phosphorus to normal levels. Calcium carbonate and vitamin D supplements are the only currently approved treatment. However, NIH studies have shown the investigational drug PTH to work well as an alternative therapy. If hypoparathyroidism is diagnosed and treated early, outcomes are usual good and the body grows normally. If hypoparathyroidism is left untreated, complications can include a blocked airway due to severe muscle spasms, stunted growth, malformed teeth, development of cataracts, and calcium deposits in the brain. Please describe your symptoms associated with hypoparathyroidism. What kinds of treatment, including supplements or medication, have you received for hypoparathyroidism? Calcium carbonate (Caltrate 600, Os-Cal 500, Tums Extra, Tums Chewy Delight, and Many Other Brands and Generics) is a prescription drug used as part of a regimen to prevent and treat osteoporosis in individuals with low levels of calcium in their diets and as an antacid for minor upset stomachs. Side effects, drug interactions, dosage, storage, and patient safety information should be reviewed prior to taking any medication. During pregnancy indigestion may become worse. Home remedies, medication, and lifestyle changes can help relieve and cure indigestion its symptoms. vitamin D (Ergocalciferol [Vitamin D2], Cholecalciferol [Vitamin D3]) is required for the maintanence for bones and teeth. It works to increase absorption of calcium and to prevent its loss through the kidneys.